Your reward for a shower well done. So you've emerged from your shower squeaky clean and feeling good. Now its time to complete the indulgence with our decadent massage bars and lotions. Solid bars, chock full of moisturizing oils, nut butters and fragrant essential oils so your skin will be velvety soft all day long. And your nose will smile, too. For a little extra fun, use them on someone else. But what are they?! Well, think of them as lotion without the water. These lovelies melt on contact with your skin to provide intense skin conditioning and moisturizing with cocoa butter, coconut oil, and beeswax. The massage bars have enough "slip" to work well for massage, too. 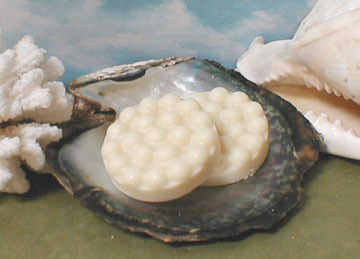 The lotion bars have shea butter for an extra dose of nourishing, hydrating treatment for your skin. Your knees, elbows, and feet will be especially thankful! A special edition Hawai'ian slipper with an incredibly cheerful fruity scent. You just have to smile as it glides over your skin. A truely decadent, tropical treat for your skin with luxurious mango butter and the aroma of ripe mangos. Made with aloha! 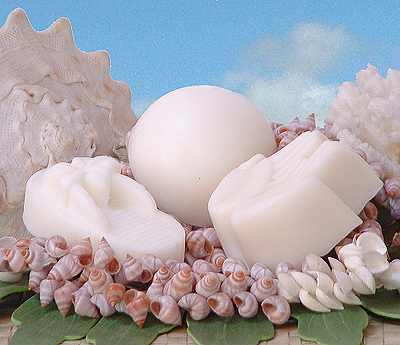 All the fabulous qualities of our cocoa butter massage bars with the addition of Monoi de Tahiti. And who says you have to share it? This bar makes a great moisturizer, as well as being wonderful for massage. Softness never smelled so good! For more of a good thing, take a look at the rest of our South Pacific line! A tranquil blend of pure cocoa butter, amber, frankincense, and sandalwood essential oils. Now all you need is a mantra. If you already have one, take a look at our Lotus Yoga Collection. Drench your skin with the tender combination of honey, sweet clary sage and exotic sandalwood essential oils in cocoa butter. The oils are chosen to induce euphoria and relaxation. Bring it on!